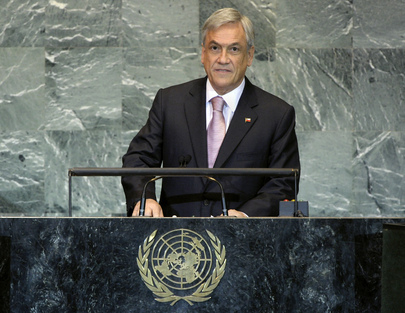 SEBASTIAN PIÑERA ECHEÑIQUE, President of Chile, said everyone shared similar challenges and opportunities alongside the same desire for peace, freedom, justice and prosperity for peoples and nations. Now everyone was facing a new world — the offspring of a knowledge, technology and information revolution that presented new risks, challenges and opportunities. Addressing the consequences required concerted action. The world must urgently reposition itself and rethink the structures of organizations, such as the United Nations, the World Bank, the International Monetary Fund (IMF) and other global and regional bodies. The new revolution, like the agricultural or industrial revolutions before it, would be generous towards some and bypass others, depending on the degree of unity. He said his country had been unable to get on the “industrial revolution bandwagon” and, as a result, was part of an underdeveloped region, with many living in poverty. Together, nations had a great responsibility to ensure that the benefits of the revolution of knowledge reached all, and not ultimately favoured some to the detriment of others. Such efforts could only be effective through promoting and expanding freedom to create real equality of opportunity for all. For its part, Chile had extended efforts in many spheres, including negotiating for Security Council reform to make it more representative of the new world order and signing free-trade agreements with 58 countries, representing 80 per cent of the world’s population. Chile also recognized the Palestinian State, hoping soon to welcome it to this Organization, and it had strengthened South-South and triangular cooperation in the area of social welfare. What was needed now, he suggested, was the building of development pillars, investment in science and technology, promotion of innovations and entrepreneurship and building of flexible societies able to adapt to change. The race for development must be won in the classroom, as education was the “mother of all battles” and, unfortunately, in many cases, also the Achilles heel of emerging countries. Recently, Chilean students had demonstrated in favour of quality education for all, a mission shared by the Government. He invited all Latin American nations and Governments to join Chile in celebrating a strategic partnership that would ensure a quality education for all. Regarding the President of Bolivia’s reference yesterday to its claim to obtain sovereign access to the Pacific Ocean through Chilean territory, he said there were no territorial issues pending, and that Chile had always been, and would always remain, willing to dialogue with Bolivia. He said that everyone here had the right and duty to speak and act in defence of the interests of respective nations and peoples, but he could not ignore the fact that, in order to be fruitful, acting in those interests required work on the many things that united, rather than divided us. “When all is said and done, whether we like it or not, the risks and storm clouds looming on the horizon, the challenges and opportunities that we shall encounter, and the responses and solutions that we shall have to implement are the same or are so interlinked that it is difficult to see where the responsibility of each member of this Organization ends and where the responsibility of others begins.” Even though each one acting alone could move faster, history unfailingly showed that it was only when acting together could the world succeed and excel in its endeavours.